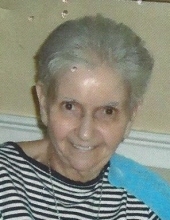 Georgia P. Varitimos, age 82, died on Monday, March 18, 2019 in the Hellenic Nursing Home, in Canton MA. From her birth in Norwood MA, on August 21, 1936 to her death on Monday she nourished people around her with love, faith, and conversation. She was born at Norwood Hospital and was the youngest of three children. Georgia was very popular in high school where she hung with her best friends Porta and Dom, and met her future husband Tom—an out of town boy—at a high school dance. They were inseparable. Georgia and Tom married in 1956 and made their home in Norwood. A few years later Georgia had her first child, a son named Ernie in October of 1960, but Tom was drafted into the service where he served in the air force to eventually rise to the rank of Master Sergeant. In the meanwhile Georgia moved to Maine to stay with her sister Jane and family until Tom finished his service, after which they both came back home to Norwood. Soon after, Georgia had her second son Peter in June of 1964. They had by all accounts a nuclear family, and a “Leave it to Beaver” life style. Georgia and Tom made a loving house hold for more than 50 years, before Tom succumb to brain cancer and Georgia needed the care that only a nursing home could provide. She is preceded in death by her sister Jane and brother Mike, and survived by two children and four grand children; Rachel, Melisa, Emmit and Antonio, and niece Joanne, and nephews. Georgia will be remembered as a bright, shining light full of life and love for her family and friends. Visiting hours will be held on Monday, March 25, 2019, 9:00am-11:00am at the Kraw-Kornack Funeral Home 1248 Washington St. Norwood, MA. A funeral home service will be held on Monday, March 25, 2019 at 11am. Burial will be at Highland Cemetery Norwood. In lieu of flowers donations may be made in her name to the Hellenic Nursing and Rehab. Center 160 Sherman St. Canton, MA 02021. The Varitimos family would like to extend our gratitude to all the staff at the Hellenic Nursing Home in Canton, for their attentiveness and loving care. To plant a tree in memory of Georgia P. (Georges) Varitimos, please visit our Tribute Store. "Email Address" would like to share the life celebration of Georgia P. (Georges) Varitimos. Click on the "link" to go to share a favorite memory or leave a condolence message for the family.